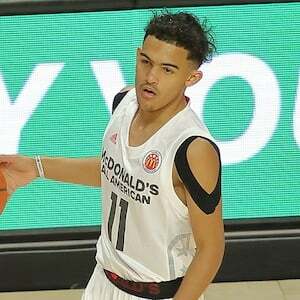 McDonald's All-American who dominated from the point guard position at Norman North High School. He went on to play collegiately for Oklahoma in 2017; he won the Big 12's Player of the Week award six times his first year there. He was selected fifth overall in the 2018 NBA Draft by the Dallas Mavericks, who traded him to the Atlanta Hawks. In his junior year of high school, he averaged 33.6 points, 4.7 rebounds, 4.6 assists and 2.4 steals per game. He helped USA's U18 basketball team win gold in Chile in the summer of 2016. He has a younger brother named Timothy and two younger sisters, Caitlyn and Camryn. He played ball with a Kansas City-based AAU team called MOKAN Elite that was sponsored by Kevin Durant.